Epic gets it for a year. 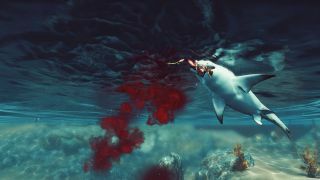 Tripwire’s shark RPG, Maneater, will debut exclusively on the Epic Games Store. Maneater briefly appeared during the platform’s trailer at The Game Awards, with the developer clarifying the nature of the deal today. It will launch on the Epic Games Store in 2019, followed by other platforms a year later. Maneater started out as a Tripwire-published game but has since been brought in-house. Players control a ravenous shark that just wants to fill its belly on sea life and any unfortunate humans that get in its path. Eventually, shark hunters will attempt to get revenge, but you can eat them, too. A healthy diet then lets you evolve your pet shark, giving it new attributes. Isn’t nature magical? The Killing Floor developer actually got its start when it won a Making it in Unreal competition with Red Orchestra: Combined Arms, so the connection to Epic goes far back. Epic seems to be snatching up plenty of exclusives, including World War Z and Hades, but the store itself still has some ways to go. It’s slick, but it has some flaws.